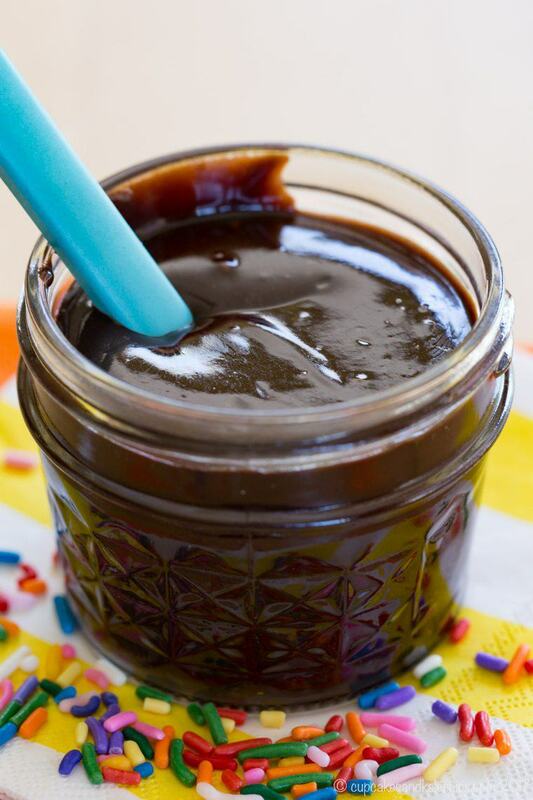 This easy Hot Fudge Sauce recipe is made with only four ingredients in about five minutes. With its rich chocolate flavor, you'll want to pour this homemade hot fudge over ice cream, strawberries, and more. 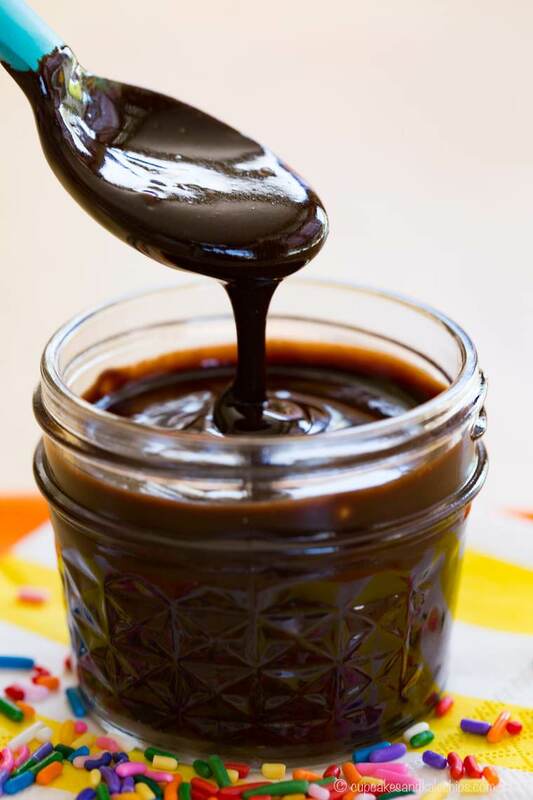 Easy Hot Fudge Sauce recipe has only four ingredients and it’s ready in about five minutes. With rich chocolate flavor and a velvety smooth texture, it’s dangerously simple to whip up this homemade hot fudge to pour over your favorite ice cream, dip berries or apple slices, or just eat with a spoon. It’s OK, I won’t tell. 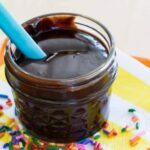 And if there is any leftover chocolate sauce, you can store it in a jar in the refrigerator, then just warm the easy fudge sauce in the microwave or on the stove the next time you are craving a hot fudge sundae. Bonus is that it is also gluten free! 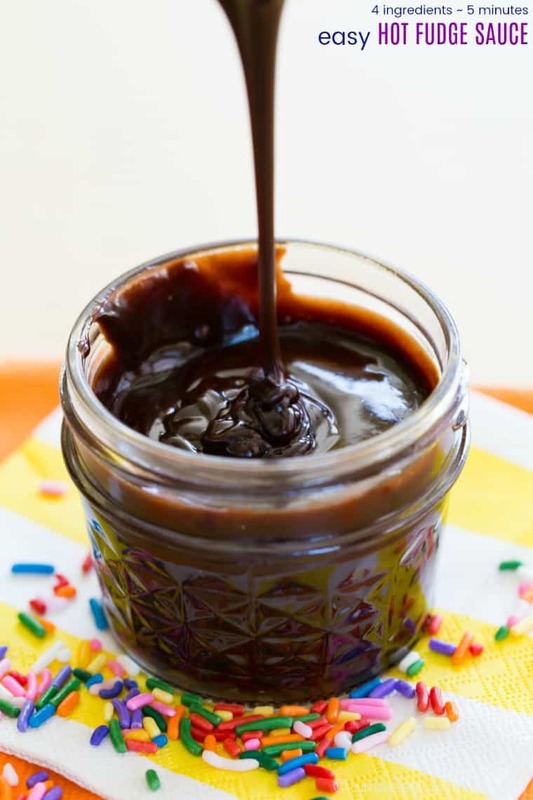 All you need is a stove, a whisk, and a pot, and heavy cream, cocoa powder, corn syrup or brown rice syrup, and chocolate chips or chopped chocolate to make this easy hot fudge sauce. Whisk the cream, cocoa, and syrup together, bring it to a boil, and let it bubble for several minutes till it gets thick. Remove it from the heat then stir in the chocolate chips till everything is melty, smooth, and velvety chocolate goodness. You guys, my baby graduates preschool today. He has been practicing his songs (three each in English, Spanish, and Chinese, no less) for weeks, walking around the house singing “Hola Amigos” and “From Me To You” and some other song in Chinese that I can’t really understand, all the while telling me he doesn’t know any of the words when I ask him to sing for me. They had rehearsal last week, and he knows he is getting a fake diploma during the ceremony, and Mr. Toby will have the real ones. He told me they will be waving when they walk in and when they walk out. He is ready for graduation. I think he is actually ready for Kindergarten, too. He knows his letter and numbers, he is starting to read a little, he knows some basic addition facts, and, thanks to his older brother, he can tell time on a digital clock. I am typically one who celebrates and gets excited about my kids achieving new milestones and learning new things. I am decidedly not in the “stop growing” or “make time stop” or “they grow too fast” camp. Well, till now. I’m actually a bit teary. I was definitely thrilled to get out of the newborn stage, which was really hard for me. Getting beyond potty training was like a dream come true. Being able to get through the day without scheduling everything around naps or risk an epic meltdown at 5pm makes life so much better. But the thought of them both being in elementary school is almost unreal. And I’m actually sad mostly because after spending the last three years with this group of kids and making some great friends, they will be splitting up to different elementary schools. But his preschool has been amazing, and not only has he learned everything he needs to be ready for “reading, writing, and ‘rithmetic,” but my little social butterfly also has learned how to make friends and be a good friend. So while he will miss his buddies, I know he will be fine. 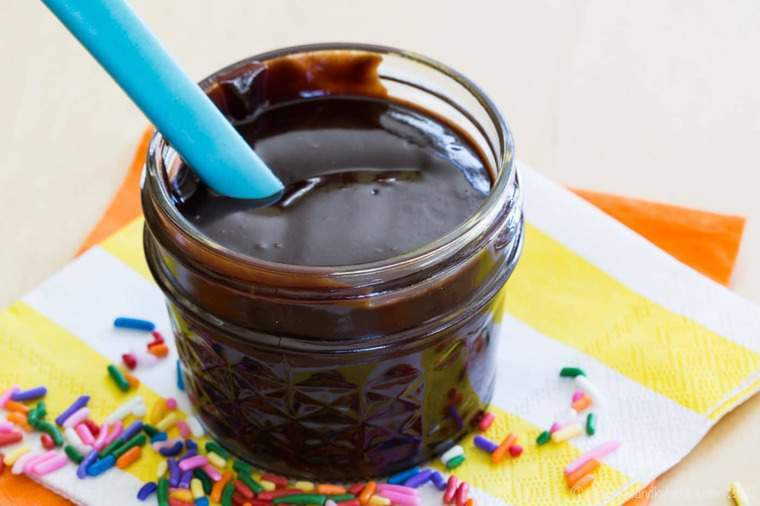 In no time at all, a batch of this homemade hot fudge sauce can be ready for drowning your sorrows or celebrating with an Ice Cream Cake Sundae Party. Or let it cool a bit and use it as the middle layer of a homemade ice cream cake. Since this doesn’t make a huge amount of fudge sauce, I like to use a small saucepan so that is doesn’t boil and burn too quickly. 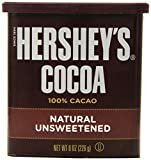 I’m a classic Hershey’s Cocoa Powder kinda gal, but use your favorite. If you prefer not to use corn syrup, brown rice syrup works just fine in this recipe. Make sure you whisk your heavy cream, cocoa powder and corn or brown rice syrup together before you put it on the heat so that everything gets evenly incorporated before it starts to bubble. Once it is boiling, you’ll only need to let it boil for 3-5 minutes or so until is starts to thicken. You’ll want the consistency just a bit thinner than how you want your fudge sauce to be at the end because it will thicken when you add the chocolate. I usually use chocolate chips because I typically always have a big bag on hand and don’t want to chop up a bar if I want to make this quickly. But either works fine. Serve your hot fudge right away, or store it in the refrigerator in a jar for up to a week. Just warm it up in the microwave or on the stove just till it is pourable. You can swap the heavy cream for Irish cream (or Irish cream coffee creamer) and make Five Minute Bailey’s Fudge Sauce. Just sayin’. What kind of ice cream do you want for your hot fudge sundae? No-Churn Caramel Toffee Chip Cheesecake Ice Cream has swirls of creamy caramel and bits of toffee and chocolate in a sweet and tangy ice cream. 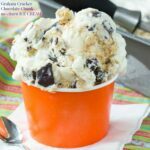 Graham Cracker Chocolate Chunk No-Churn Ice Cream is a copycat of Bruster’s Graham Central Station that might be better than the original. 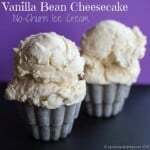 Vanilla Bean Cheesecake No-Churn Ice Cream is simple and indulgent. 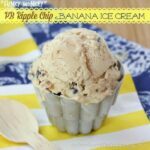 Funky Monkey Peanut Butter Ripple Chip Banana Ice Cream is the ultimate combination of banana, chocolate, and peanut butter. 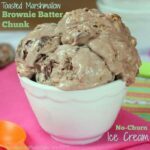 Toasted Marshmallow Brownie Batter Chunk No-Churn Ice Cream is loaded with toasty marshmallow and big chunks of chocolate in ice cream that tastes like you are licking the bowl of brownie batter. 3 Ingredients Strawberry Ice Cream from Foodie With Family will taste like chocolate covered strawberries when you douse it with this sauce. Make it mocha with Espresso Ice Cream from Brown Eyed Baker. And sometimes there is nothing better than keeping it simple with 3 Ingredient Vanilla Bean Ice Cream from Rachel Cooks. Thick, rich, velvety, and oh so chocolaty, this homemade fudge sauce will satisfy the most intense chocolate cravings. Whether you pour it over ice cream, use it as a luscious dip for fruit, or drizzle it on another favorite dessert, you’ll never go back to the stuff from a jar. Not when you can whip this up in just about five minutes with only four ingredients. Your sundaes never had it so good. If you make and love it, I hope you’ll leave a comment and give it a FIVE STAR rating and share a photo on this pin on Pinterest! Whisk together the heavy cream, cocoa powder, and brown rice or corn syrup in a small pot until smooth. Bring to a boil, stirring frequently, then reduce heat to low and simmer for about 3-5 minutes, until thickened slightly. Remove from the heat and add the chocolate. Stir until smooth. 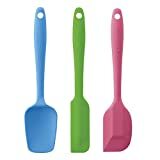 Cool slightly and use immediately, or store in the refrigerator. It will be thick once chilled, so you'l need to warm it in the microwave or on the stove. I have been searching for an old recipe and I have found several but not the one I have. My irritation here is that every one of the recipe blogs have way too much “chatter” and too much scrolling to find the recipe. I am commenting here because I am frustrated. What happened to just recipes and a photo or two? Too much scrolling wastes times. I’m sorry that you feel that scrolling for a couple seconds in order to get your free recipe takes too much of your time. I’m glad that you had the opportunity to air your frustrations with all blogs here on my blog. There are actually a number of reasons for the length of our content, some of which is to provide additional useful information about the recipe and ingredients. In my case, I have started focusing on making sure my recipes are all gluten free, so I am adding a section to explain whether it is gluten free and what would need to be changed to make it gluten free. The other is that this is a blog, not a recipe website, so yes, many bloggers like to use their blogs to express themselves creatively in multiple formats, including writing. If you are interested in neither of those things, you’ll notice on my website, just below the recipe title, I have a button to click that will bring straight to the recipe in a fraction of a second. I hope that saves you time. I looooooove hot fudge sauce SO much! This looks like a great one!